Proper preparation prevents poor performance. This is an old saying from the British Army, but its appropriateness for business, and particularly in PR, is unquestionable. Say you’re approached by the media right now – are you ready? If you have a suite of materials ready to deploy that give a full context of your business, it’s most valuable players, flagship products and innovations, the philosophy and relationships developed with customers, and more, then perhaps you are. If you don’t have this ready to go, then you risk missing opportunities to boost your business. 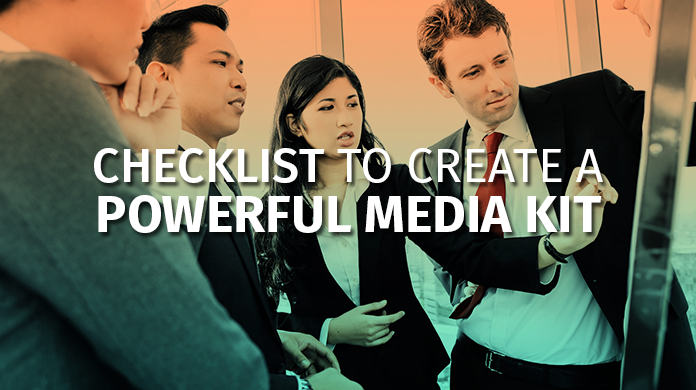 Today, we want to help you understand the process of creating a media kit for business. We want to help you develop a packet that can deployed on a moment’s notice. It will include all the basic information reporters need to establish a context and an angle on the story you’re trying to tell. Whether you are promoting the launch of your new business, promoting the launch of products or services, or simply providing background information to interested parties, this guide will help you present your business as you want it to be seen, while answering many of the most common questions the press will want to ask. With this created, you’ll have eliminated a lot of the major hurdles than stand in the way of your PR campaigns, and facilitate better coverage from journalists by making their job easier. The result? More exposure, more leads, more customers. When wondering how to create a media kit, it can be daunting to think of all the possibilities. What to include, what not to include, how to structure it, how to phrase it even. Well, worry no more. This is what you need, in a nutshell. From here, you can either begin composing it yourself or hire a copywriter to create one for you based on this template. In a press release, the boilerplate comes at the end of the release to provide a top-line summary of what the business does. In a media kit, you can put this first. The boilerplate should be a compelling and concise summation of the business: what it is, what it does, it’s impact in the present market. Are you Product or Service based? Your process – do you have a set way of doing things that confers an advantage? In today’s world, . Your company needs to have a vision and a mission – this isn’t new – but that mission has to stand for something that makes the world a better place to be in. We’re currently 2.5 minutes to midnight on the doomsday clock, we need a little positivity. The best way to think about this isn’t getting in caught up in high-minded philosophy. Rather, express a simple wish, and have your products or services be extensions of that wish. You are manifesting a better reality, motivated by a simple goal. Remember, there will be a hundred other companies at least doing what you do, many of them bigger and better funded. To compete, you need to differentiate. Your mission, if it’s informed by authentic values, can help do just that. For journalists, having a value-informed mission statement, if it’s supported by context from the biographies of your top people, can help ‘storify’ the journey of your company for them. It’s a hook, so make it a good one. Endorsements are more powerful than tooting your own horn will ever be, and the most common form of endorsement is the customer testimonial. By including testimonials, you are essentially providing proof that your product works as advertised, and that journalists aren’t going to be red-faced if they decide to promote your business through a feature. Many businesses fear opening themselves up to review – there are horror stories out there that can put you off for good. But having reviews shows an unshakeable confidence in your product, and allows you to utilize the power of that influence for good. Testimonials don’t have to come solely from customers either – influencers in your field, product reviewers, or even other journalists can be used to add instant credibility to your image. If you have a celebrity endorsement, make sure people know about it. 4) Showcase High Profile Clients. Similar to testimonials, if you have any high profile or influential clients, make sure you tell the press about them. If you’ve provided IT consultancy to IBM for instance, you will instantly be in demand from any small business that would need similar services. A popular way to do this is with visuals – if there are singular CEOs with a high public profile, use their picture (with permission of course). If there are strong brands you’ve worked with, even internally, get their logos in a strip across one of your pages. Journalists are won over by knowing what the circles of influence you work within. Siphoning off some of the brand power of your multinational clients can go a long way in making you look similarly influential. A media kit should include multiple versions of your logo for use in features and articles about the company. You should also include images of your most valuable people, your products, and even your working environment. Images have a far more profound effect than text, and if journalists know they can accompany their story with glossy images, they are far more likely to want to run the story. You can even include links to multimedia, with video featurettes, interviews or even commercials being valid forms of context for potential stories. One of the biggest advantages of having a media kit is the opportunity to get all the most commonly asked questions answered and out of the way, without having to waste your staff members’ time and resources answering them over and over again. Answering these questions up front with FAQs, in an emphatic and definitive way, can allow you get beyond what has controlled the story so far and instead shape the journey to be defined by your priorities. Your first and last questions are the most important. The primacy and recency effect ensures that people will remember the first thing and last thing they see. That means whatever ‘boring’ questions you don’t want the focus to land on can be shuffled into the middle of the stack, increasing the chances of people picking up on what you find most interesting. Now you’ve made certain that your company is thoroughly explained, supported and polished in the eyes of the media, it’s time to introduce your products or services. Here, it’s important to emphasize your flagship products and service of course, but it’s also important to emphasize the most unusual or specialist products and services you have available. This will again help to differentiate you and create something memorable in the eyes of your audience. Understanding that there is a high level of commercial specialism is more distinct than ‘just another’ generic product or service. You need to be as upfront and transparent as possible about the costs involved. This will save you time and potential customers time. Your price points are also a talking point in the media – socio-economics is a major factor in defining audiences, and so journalists will know best who a story about you would best serve according to your price ranges. Budget, mid-range, high-end and luxury products and services all have very different audiences, but all are catered to in the media. A clear breakdown will help you manage expectations and demonstrate transparency. Establish a spokesperson who will be the primary point of contact for the media. Share their details in the media kit so journalists know who to contact for enquiries and further information. This can include an image of the person in question looking friendly, a short biography of their role in the company, and their email, phone number and company socials. 10) Get It Out There! Make your press kit readily accessible. Jimmy Case have it on their website, with testimonials from high profile media outlets, lots of imagery and multimedia, together with a summary of the business. Luminaid have gone with a downloadable PDF, which allows them to have a more impactfully designed presentation. Notice they’ve put contact details on the web page as well as in the pack for the fastest possible contact. This is my recommended choice. Pure Cycles have stripped it back to a simple catalogue of previous features, leaving journalists to request anything they need from the press team. In my view, this is not advisable – sometimes journalists don’t know what they need until you present them with it, and limiting your options to only fulfilling expectations instead of feeding the imagination makes it harder for you to maximize your chance of coverage. I’m aware we’ve covered a lot today, so here is a checklist you can use to tick your way through the creation of your first Media Kit. If you want to create your own press releases to accompany the deployment of your shiny new media kit, then you can use the templates from PRShelf to guide you. Alternatively, use the professional writing services provided by PRWire Asia to get them written for you. Any questions? Feel free to ask them in the comments below. Alternatively, if you’ve aced your press kit and found something really useful was missing from our checklist, tell our readers about it in the comments!